The traditional response to stormwater management has been to convey it by pipes or channels directly by a discharge point such as a nearby river, lake, creek or ocean. The goal has been to move as much water as possible from an urban area as quickly as possible. The biggest challenge happens when dealing with large, impervious paved spaces. During a heavy rain, thousands of litres of water can accumulate quite suddenly. For the most part, pipes are effective for carrying away the excess unless they become blocked. Channels are less prone to blockage, but either system really only accomplishes the transference of the problem from one location to another. The receiving water body experiences a disruptive shock when massive volumes of stormwater containing suspended organic particles and contaminants arrive at once. In designing infrastructure that is sensitive to the impact on local water bodies, urban planners and builders look for ways to imitate the natural water balance on site. It means drastically slowing down the overflow before it reaches a river, lake or ocean. The most effective method discovered is through the installation of permeable surfaces on driveways, footpaths, sidewalks, parking lots or any space that would normally be covered with concrete or asphalt. Local councils have begun to restrict the footprint of impervious surfaces. Why is StoneSet Ideal for Water Sensitive Urban Design? In the natural environment, rainfall is managed by soaking back into the ground and StoneSet enables just this. The StoneSet system is specifically designed to accommodate the needs of urban living while simulating the nature's response to rainfall. We choose the aggregate blends of gravel or decorative stone best suited for each project. We incorporate the precise amount of binder with the stone to maintain strength and durability while allowing sufficient void content for permeability. There is a science to replicating nature's perfect balance and we have achieved it successfully. 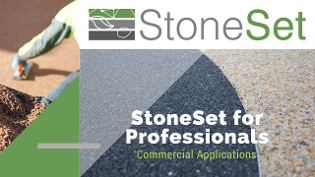 To learn more about using StoneSet in your water sensitive urban design, please contact us!